When teaching students how to learn new vocabulary words, helping them to develop strong reading skills is also key. When a person learns a word through repeated interaction with the word in a book, that person is more likely to learn and retain the word than if they learn the word through encountering it in a more structured vocabulary list. Furthermore, students who read a lot tend to have better vocabularies, which can result in having students perform higher on standardized tests that feature vocabulary components such as the SAT, ACT, GMAT and GRE. As a result, encouraging reading and learning vocabulary words in the classroom is essential for teachers, and encouraging reading in the home is essential for parents. Games and activities should encourage students to read as much as possible and should challenge students to learn to develop a taste for reading. Encourage students to read by conducting a contest to see who can read the most books over the course of a month. Give a student a gold star for each book that the student reads. A chart with each students name on it can be placed in the front of the classroom so they can track their progress. The student who reads the most can be awarded a reading related prize, such as a bookmark or a favorite book. Students can be encouraged to be the first in a class to finish a book. Assign each student in the class a book to read, and the first student who can successfully complete the book (and answer a few key questions to ensure they read it in full) will be named the winner. If you prefer to use more cooperative activities to encourage students to read, you can set a class goal of a certain number of books that the class as a whole should read. Students can work cooperatively to complete all the books on the list, or to read the number of books that you set as the goal. If the class successfully completes the goal and reads the required number of books within the given time frame, the whole class can be awarded a prize such as a pizza party or a special field trip. To encourage reading at home, parents should also read with their children or set reading goals. Teachers can facilitate this by talking to parents about being reading partners with their children. Children, especially young children, will benefit from reading out loud to a parent or even being read to. Both younger and older children alike can benefit from seeing parents read and form learning and understanding that reading is fun, so family reading night (or hour) should be set if possible. 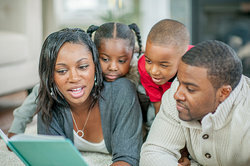 Teachers can encourage parents to adopt these techniques, or parents can use them on their own to help encourage their children to develop an active love for reading. Students can also be encouraged to love books through games that that bring books to life. Allow students to act out a scene from a favorite story or play, developing the script to suit the needs of the classroom and to put their own unique spin on it. Each student can be allowed to come to school dressed as their favorite character from a book for the day. The students can act in character and the other kids in the class can guess who they are. While reading in general can improve vocabulary, students should also be encouraged to read actively to develop vocabulary skills. Create a list of words that they do know. They can look up the words and keep this vocabulary list with them to demonstrate how many new words they are learning as a result of reading books. "Reading Activities and Games for Vocabulary." YourDictionary, n.d. Web. 25 April 2019. <https://education.yourdictionary.com/for-teachers/reading-activities-and-games-for-vocabulary.html>.